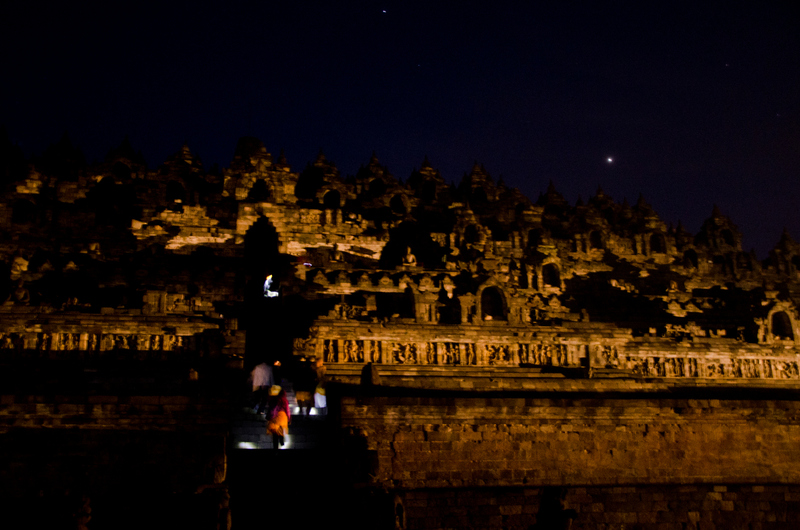 I knew almost nothing about Borobudur Temple when I arrived there on a starry morning one December day. 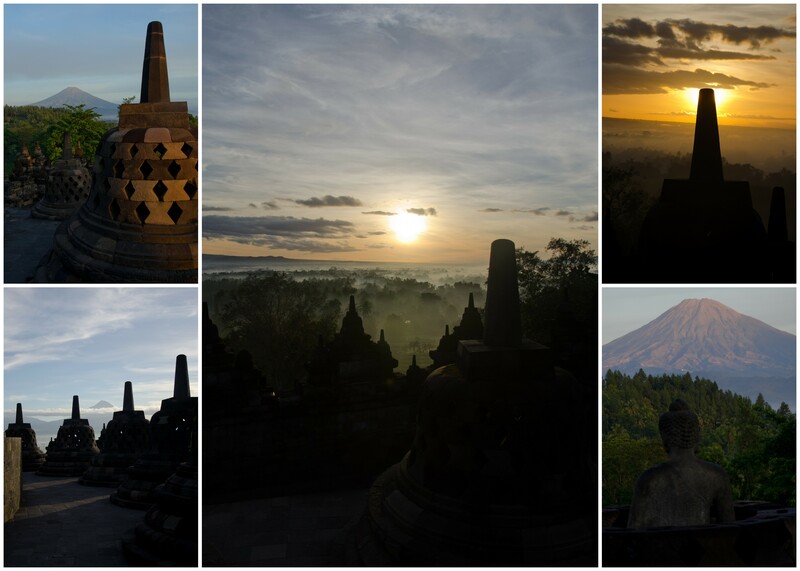 I knew that it was a UNESCO World Heritage Site, the largest Buddhist structure in the world, and a beautiful place to watch the sunrise. It was this last piece of information that brought me to the Manohara Hotel’s front desk at four o’clock on that particular morning. 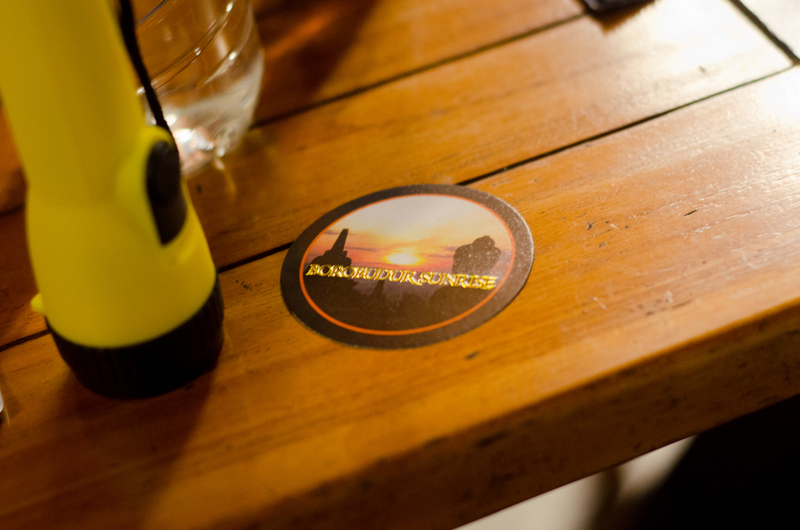 The hotel is the only place you can buy passes for the sunrise tour, so Josh and I purchased our tickets and were ushered to the hotel’s deserted outdoor cafe area, where we were soon presented with a small flashlight, a sticker, and a bright yellow sarong to tie around our waists. 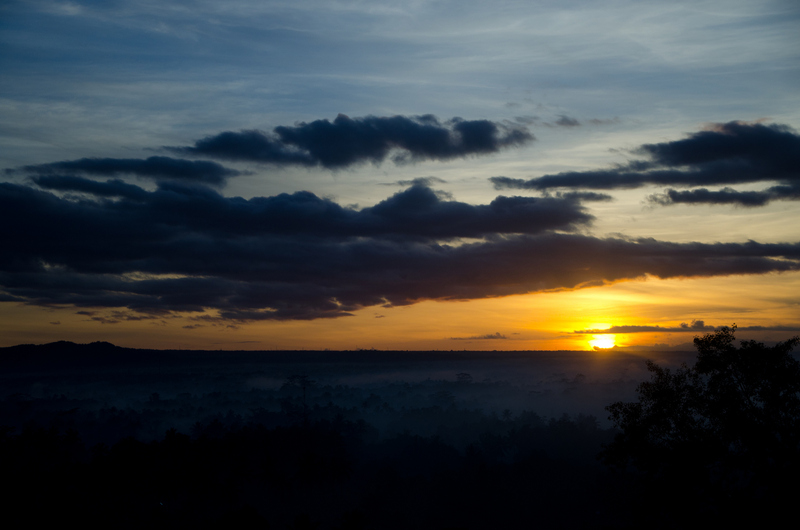 Though the region had been experiencing wet and cloudy weather typical of the rainy season for the past few days, we were assured that this morning would be the first clear sunrise the temple had seen for more than a week. The dark sky full of shimmering stars confirmed this promise of a brilliant daybreak, and we knew we were about to experience something amazing. Around 4:30, we and a few other early risers embarked on a quiet walk to the temple. The sky was still dark, and our small flashlights were the only thing lighting our way. Nonetheless, we could just barely glimpse the temple’s massive silhouette five minutes later as we neared the craggy edifice. We slipped through the gates, and we began our ascent to enlightenment. It was too dark to admire the reliefs on the stone walls, so we climbed straight to the top, arriving there breathless several minutes later. 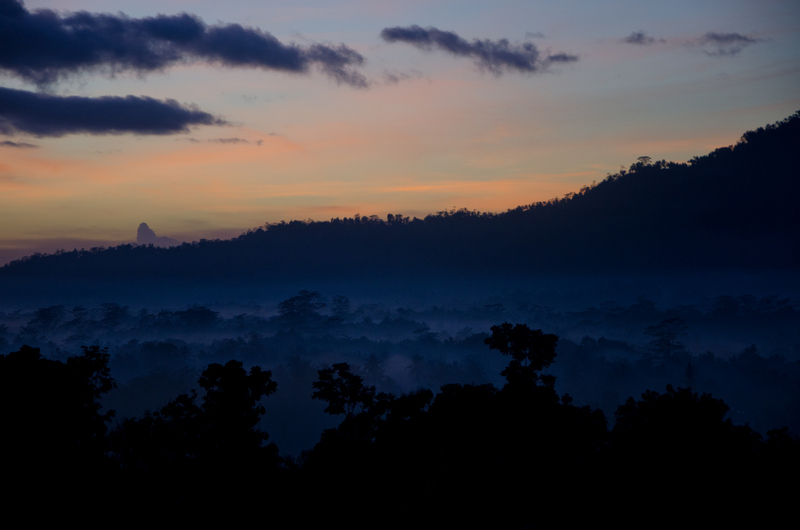 The sky was beginning to get lighter, and soon we had an amazing view of our surroundings. Misty trees stretched across the horizon on all sides of the temple as we walked around for a full view. Volcanoes were etched into the skyline, and a plume of smoke adorned what we later found out was the still-active Mt. Merapi. Blues and purples were soon joined by pinks and oranges, and eventually a golden flame burst forth as a fierce, fiery light illuminated the earth. Slowly, we watched as the temple was covered in golden light, the fog that hovered in the trees slowly started to dissipate, and the sunlight illuminated all but the deepest cracks and crevices of a nearby mountain. 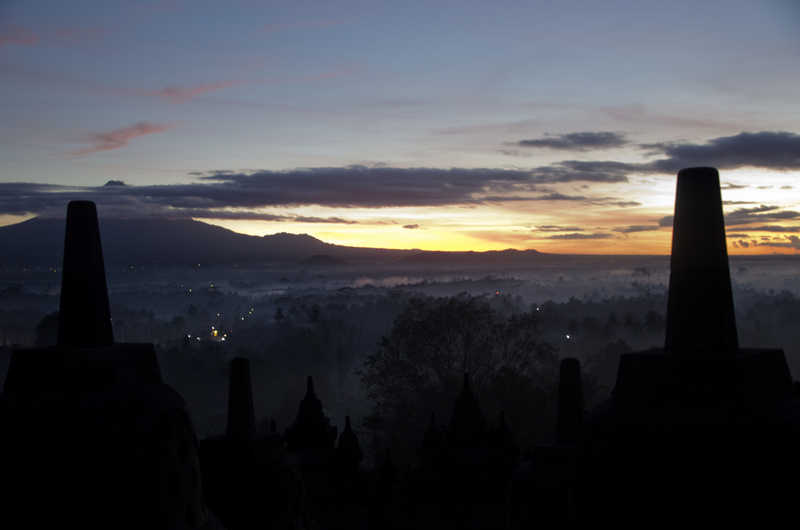 There’s absolutely no question that Borobudur is a significant site–culturally, historically, and religiously–but I think anybody who visits should view the temple at sunrise. It adds a whole new level of spirituality to what is already an awe-inspiring place. 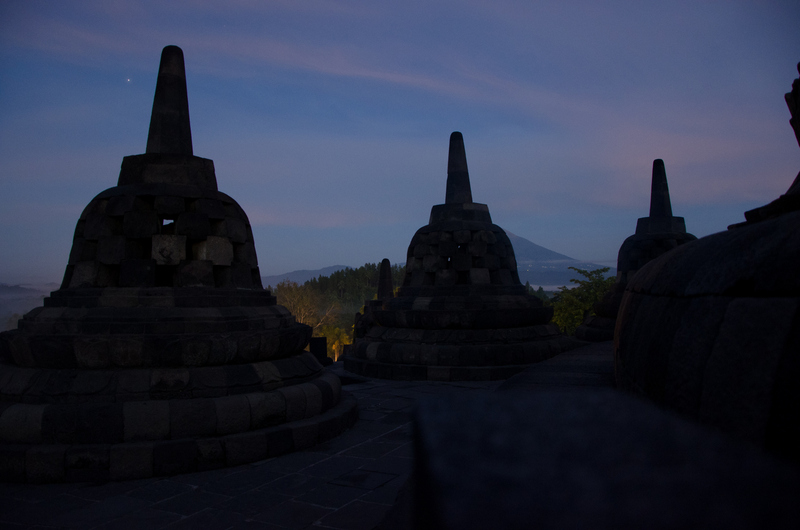 And while Borobudur is just as impressive during the daytime . . .
. . . it’s just not quite as magical. 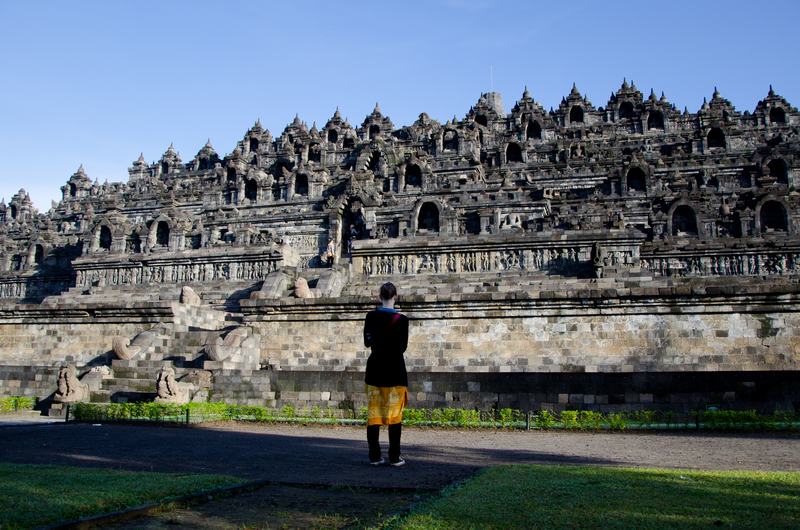 What a lovely story…I never heard of the Borobudur Temple ! You and Josh are so blessed to be able to see all the wonderful places in this awesome world. Thank you Josh for taking the pictures. Elizabeth from your great description I felt like I was there to.